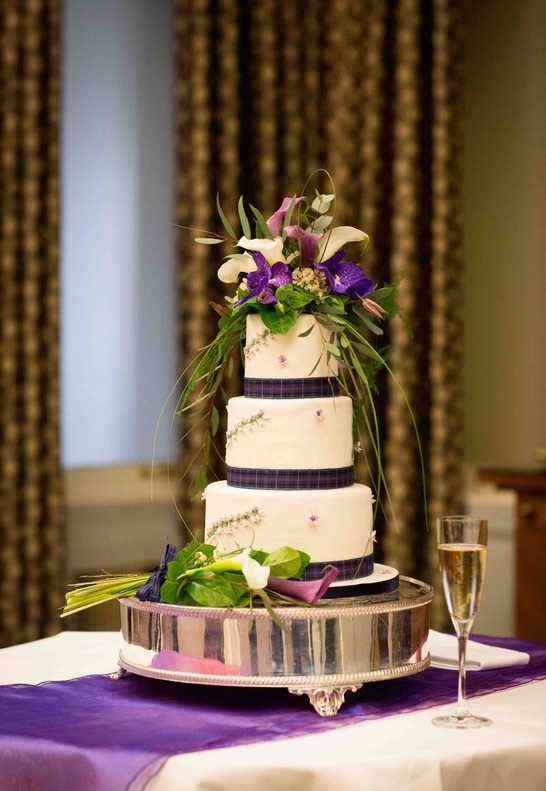 We are frequently asked in our cake decorating shop, how to stack a tiered wedding cake or birthday cake. So, we thought we would spend a little time explaining some simple steps to help you, safely build tiered wedding cakes. A stacked cake is a design where cakes are positioned directly on top of each other, as opposed to using cake pillars or cake separators . For any multi tiered cake, whether a wedding cake or a celebration cake, this is a very popular design! What Sized Cake Boards/Drums Do I Need? As a rule of thumb, use a cake drum board 3” larger than the size of the cake. This may vary if your side or base cake decoration requires a larger board. If cakes are stacked a cake drum board is used at the base and usually each tier stacked on top of the base cake sits on either a thinner cake card or a thicker cake board drum, the same size as the cake so that it is hidden when iced with sugarpaste. As a general rule, if you have a mixture of fruit cake and a sponge cake in a tiered cake, it is better to place the heavier fruit cakes at the bottom for stability. If the design allows, keep each tier separate and assemble at the venue for ease of transport. However this is not always possible because of the design, and it may have to be stacked before transporting. There are special cake boxes available for this purpose. It is recommended to allow the cake underneath to dry, before positioning a cake on top. Once you have iced all the cakes, check they are level. (A small spirit level is useful for this purpose) and leave to set. The base cake is usually placed on a 12mm drum board, with all other cakes on the same cake board size, as the cake. Insert plastic dowels, ensuring they are positioned within the diameter of the cake above but far enough apart to give support. After placing the dowel into the iced cake, mark with a edible cake pen, level with the surface of the cake. Remove and cut the dowels ensuring they are all level, and replace into cake. Repeat the steps above for each tier and fix each cake tier with royal icing to prevent movement. Finally, place the top tier in position. If pillars are used, we recommend that you always use drum boards or double thick boards for extra strength. The current trend for using roll out sugarpaste to ice a cake means that you do need to use dowelling as the icing is quite soft, therefore support is required for each tier. Plastic dowels come in two lengths – 8” and 12”, clear or white, and can be snapped off after scoring them with a sharp knife at the appropriate point and sharply snapping. It is essential to place the dowels in each tier within the diameter of the cake above but far enough apart to give adequate support. Make sure your cake dowels are cut exactly the same length. This will keep your cake level!